New York solar companies Archives - Solar Love! Home Tags Posts tagged with "New York solar companies"
As a clean energy leader, New York is setting an excellent example for the nation. This is a state seriously committed to the solar revolution and the empowerment of the people through the wide-scale adoption of clean, renewable energy. And, with near-term plans for implementing more than 3,000 MW of solar power, New York solar installers are lining up like race horses at the starting gate. If you’re among the folks ready and waiting to go solar in the Empire State, the following article offers an in-depth look at the solar market, as well as tips to keep in mind as you evaluate the great lineup of New York solar installers ready and waiting to get your job done right. Across the nation, solar is booming. 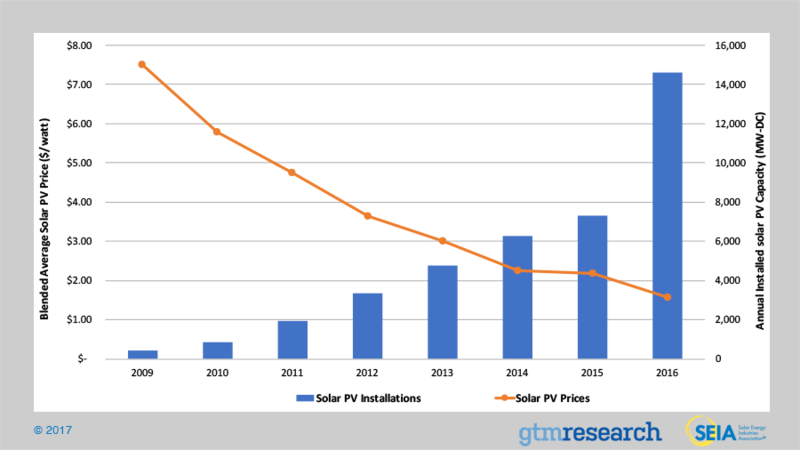 Tracking growth and market trends, the US Solar Energy Industry Association (SEIA) reports that costs have dropped more than 70% since 2010 for installing a rooftop solar system. At the same time, the average annual growth rate of solar in the US has been 68%, spurred significantly by the adoption and extension of the federal investment tax credit (ITC). There are now around 1.4 million solar installations in the US. This represents nearly 45 GW of total solar capacity installed, or enough electricity to power more than 8.7 million homes. Two million solar installations should be reached in 2018, and SEIA expects 4 million to be reached by 2022. In just 5 years, the number of Americans employed in the solar industry has doubled, rising to more than 260,000. That’s over a quarter of a million folks making a living by harvesting clean, free energy from the sun in the US. As of 2016, 39% of all new electric generating capacity came from solar installations. This was the first time solar beat all other technologies. 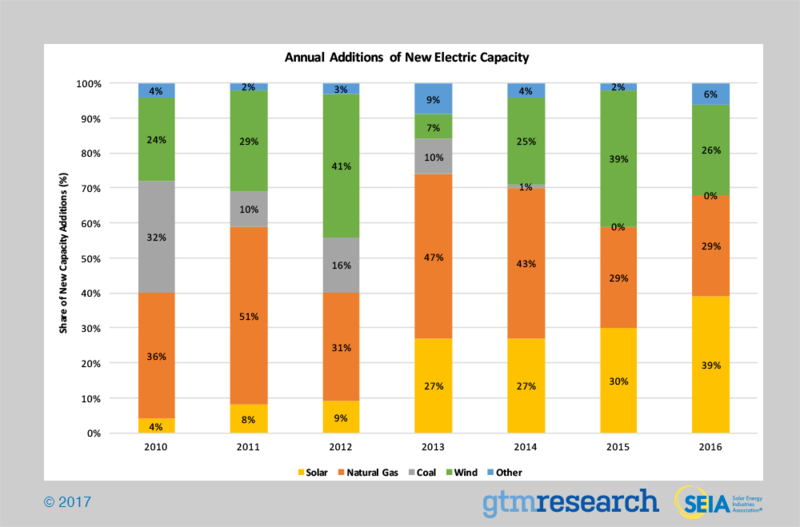 2017 looks likely to continue the trend, too, with solar hitting 30% of all new capacity for Q1. Although California has been dominating the US solar market with 35% market share in 2016, New York is claiming a fair share of the sunshine, too. 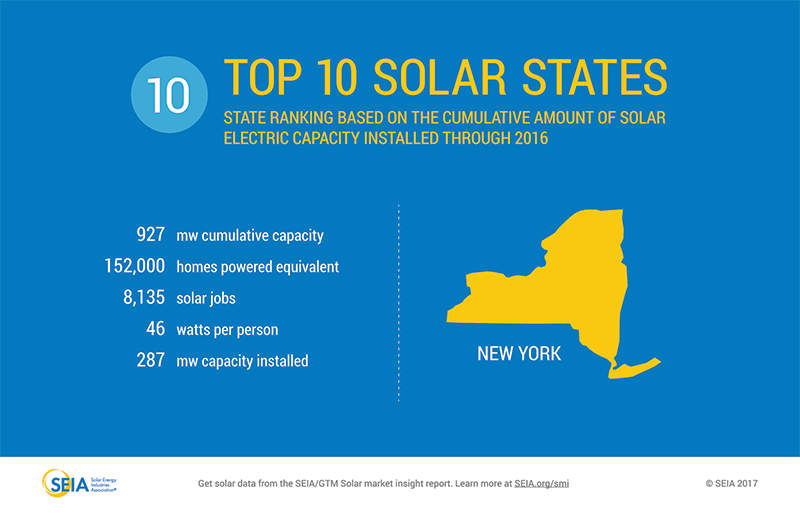 Ranking number 10 in the nation for cumulative solar capacity, SEIA’s most recent data reveals that New York reached 1,012 MW in the first quarter of 2017. Consistently in the nation’s top 10 solar markets, New York is a consistent leader at crafting positive state solar policies. Via Governor Cuomo’s commitment to the NY-SUN initiative, the NY Public Service Commission (PSC) recently launched a 10-year $1 billion program to develop a statewide self-sustaining solar market. It is this program that will bring the development of 3,000 MW of solar installations across New York within the next 5 years. This will be an ambitious effort, adding to the 1,011 MW already installed in the state, representing about 166,000 homes already powered by solar. In dollar terms, over $3,252.19 million has already been invested in New York solar energy projects, with $774.45 million invested in 2016 alone. In people terms, New York’s solar industry employs 8,135 folks, ranking 6th in the country for 2016. This breaks down into 746 companies in total, with 275 New York solar installers and developers, 94 solar manufacturers, and 363 other industry-related companies. 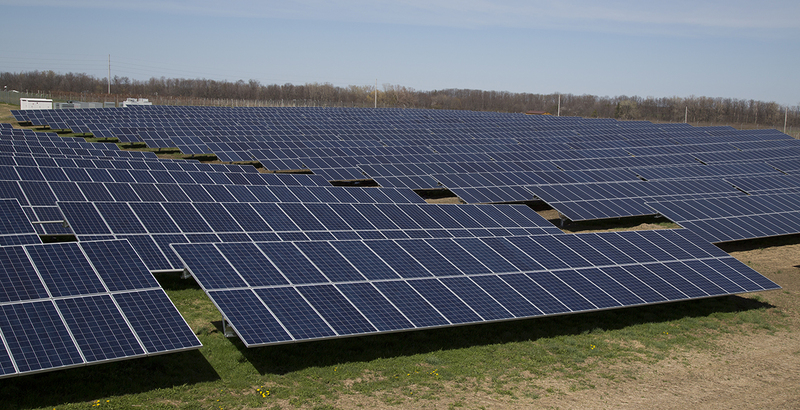 With 32 MW of solar power capacity, Long Island Solar Farm was completed in 2011 and represents enough capacity to power more than 5,264 NY homes. Other notable New York solar projects were completed by several large retailers in New York, including Anheuser-Busch, Bed Bath and Beyond, and Dr. Frank’s Vinifera Wine Cellars. Owens Corning, as well, has installed 2 MW of solar capacity in Fera Bush. Also at 2 MW, Cornell University’s solar farm owned by Argos Solar LLC in Geneva is among the NY’s larger solar installations. Completed in 2015, this installation has enough capacity to offset nearly 40% of the annual electricity demand at the New York State Agricultural Experiment Station (NYSAES) in Geneva. Like every decision to go solar, each solar installation is unique. But, no matter how it gets done, going solar is a great decision. Harvesting free, clean solar energy for powering your home is very satisfying, enhancing your green lifestyle by joining the solar revolution and helping to protect the environment. And, happily, costs have decreased 70% since 2010, so rooftop solar is cheaper than ever. 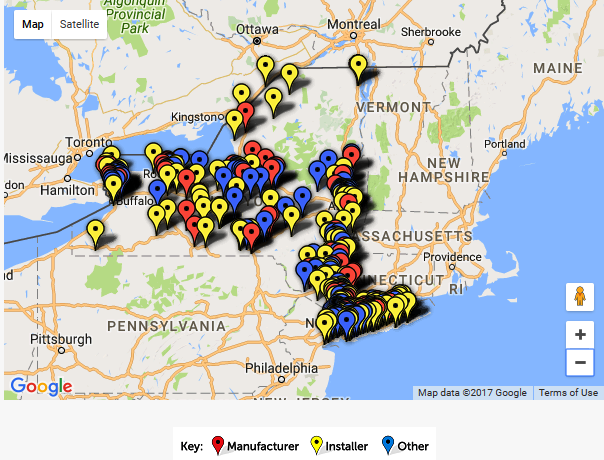 Finding the top New York solar installers is easier than ever, too. While your situation is unique, and everyone benefits greatly from getting a free solar quote, the following tips are helpful for anyone wanting to get the most efficient harvest of solar energy from their installation. Having this information at hand when you contact New York solar installers will help guide you and the installer you choose to get the job done right. Guage your future electric needs — Is your family growing, are you thinking of putting in a pool or a hot tub, or interested in solar water heating? Are you facing any time constraints over the next 12 months? Remember, too, that labor and other ‘soft’ costs account for around 50% of a solar installation. Larger solar companies regularly spend generously on ‘soft’ items, like major advertising campaigns and internet marketing sprees, and their customers regularly foot the bills. Also keep in mind that the New York solar installers you evaluate must be completely familiar with your local, state, and federal tax breaks and incentives, as well as local permitting rules, and other utility-related regulations. Finally, weigh carefully the difference between local and out-of-town New York solar installers, since local experience, ongoing support, and the prompt honoring of warranties that you are offered can be crucial in both the near term and the future. The following is a specially curated list of top New York solar installers for 2017. Please keep in mind that this list is alphabetical — it’s not ordered by ranking because ranks are based on many factors that may not apply to your situation. 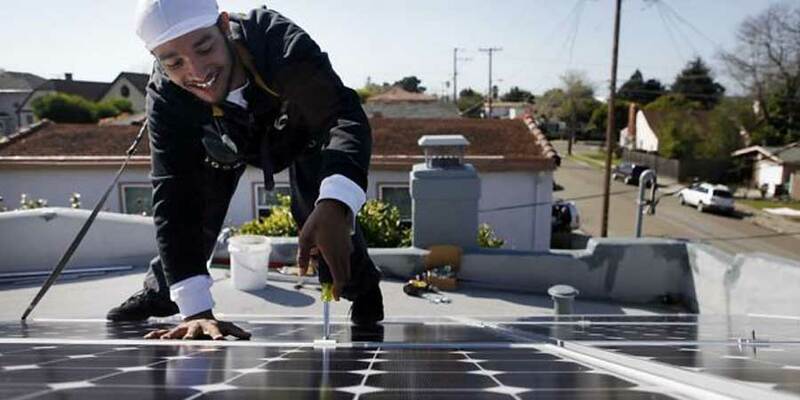 Pulled primarily from positive reviews on such websites as solarreviews.com and solarpowerworldonline.com, this list represents a perfect place to start if you ready to evaluate the top New York solar installers.